Welcome to the home of all of Coco's custom mental health PDFs. Printable, downloadable documents on self-care, finding help, crisis hotlines, sleep tips and more. This is Coco's custom PDF on finding mental health treatment! Answers all the big questions about who, where, how, and why of getting help! No one deserves to suffer alone - call if you are in major emotional distress, having any thoughts of suicide, wishing for your life to end, or have thoughts about harming yourself or someone else. This resources has tons hotlines, including many LGBTQIA+, veterans, deaf, TTY, text, and online chat resources as well as specialized hotlines, like addiction, grief, self-injury, sexual assault, and domestic violence hotlines. You deserve help. It can change your life. When our emotions get the best of us, life gets even harder. Your thoughts run in circles, your emotions get even more intense, and you don't know where to start to dial it back. This resource walks you through four practical steps you can use to have better mastery of your feelings! Are your life choices or your self-care activities helping or hindering? Does it have short-term benefits, but long-term costs, like when we procrastinate? Learn how to find positive coping strategies that actually help us feel better rather than create more problems for ourselves! Do you keep pushing yourself and then you hit that wall and crash? How do you work hard without overdoing it? Learning to pace ourselves and balance work with recovery is essential to greater productivity in the long run! We all have cognitive distortions that make our anxiety, depression, and feelings about ourselves and the world worse! Check out Coco's Crap-O-Vision PDF to learn to fight these maladaptive thoughts. When and How to Self-Care! Check out Coco’s custom PDF that mindfully walks you through how to care for yourself depending on your stress level in the moment. Here is Coco’s giant list of self-care strategies to help reduce stress, recharge, and help cope during difficult times. 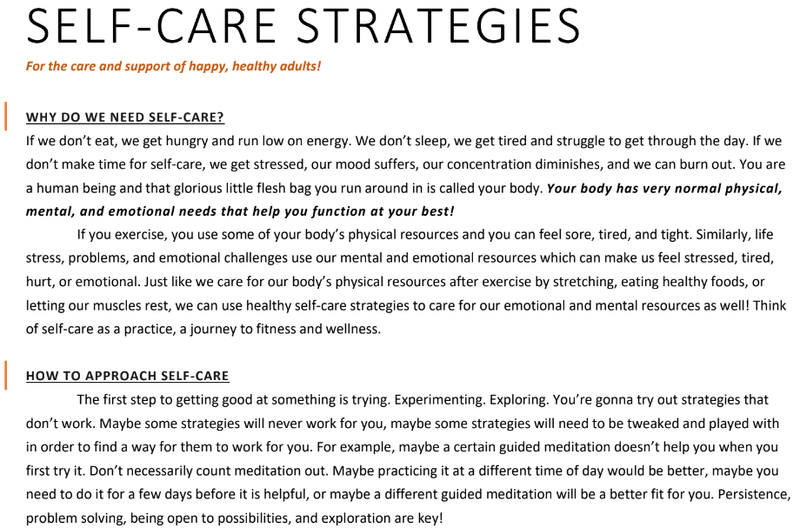 Self-care quickie tools, self-care do’s and don’ts, mental health resources, and a list of free self-care resources are included! Need help with sleep? Want to get better sleep, fall asleep easier, and wake more rested? Here’s Coco’s Sleep Tips PDF. From Pete Walker's amazing book, Complex PTSD, this is Coco's PDF to help us remind ourselves what our emotional, personal, relationship rights are for fairness and intimacy. You can read more about Pete Walker's fantastic content at Pete-Walker.com (especially recommended if you've experienced trauma or abuse). 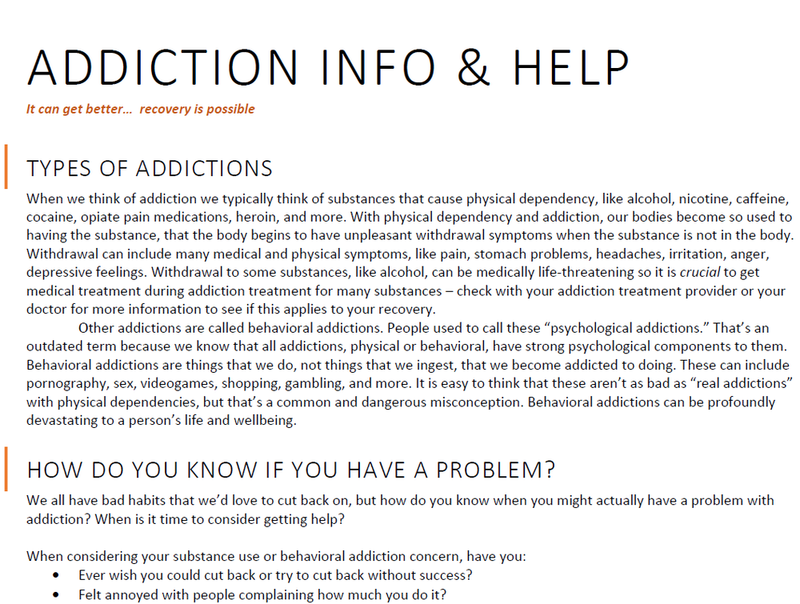 What are the different types of addictions? How do you know when you might have a problem? Learn the most important information about addictions and find out how to get the right treatment for any addictions concerns you have.